Save the date! 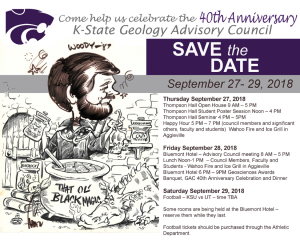 We’re looking forward to seeing as many of you as possible to celebrate the 40th anniversary of the K-State Geology Advisory Council. Humans have looked for extraterrestrial biosignatures on the surfaces of other planets and moons. These surfaces are often exposed to conditions and processes that exceed the physical limits of life, e.g., intense cosmic radiation, impact events, and large thermal extremes that would render difficult the preservation of biosignatures over geologic time. Planetary caves provide protection from cosmic radiation, small-scale impact events, and have relatively stable thermal environments. These characteristics may well permit preservation of biosignatures over long periods of time and make them a prospective astrobiology target for biosignatures beyond Earth (Boston et al., 2001; Léveillé & Datta, 2010; Martins et al., 2017). A cave (here more specifically basaltic lava tube caves) with natural openings offers direct access to the subsurface without drilling and deeper penetration into subsurface materials than could be obtained from a rover, landed platform, or penetrator launched from orbit. The purpose of this project is to develop the technology needed to enter a planetary cave with a scientific payload for deployment. The proposal, funded by NASA PSTAR [Planetary Science and Technology Through Analog Research] 16-PSTAR16_2_0015: Biologic and Resource Analog Investigations in Low Light Environments (BRAILLE) NNH16ZDA001N- funded through Aug 2020, is headed by Saugata Datta from the Kansas State University side and is in collaboration with NASA AMES, Northwestern U, Desert Research Institute, New Mex Tech. The research will focus on: 1) the identification of planetary lava caves, 2) development of subsurface exploration vehicles with advanced subsurface communications/operations techniques, and 3) development of sensor systems for biosignature identification. Dr Datta and colleagues will also focus on understanding the hydrochemistry of the cave waters, microbiome of lava caves on Earth; and focus on microbial colony morphology and association with secondary mineralogy, 16S rDNA of bacteria and identifying potential energy/chemical nutrient pathways to support microbial life. One of the major challenges facing society is the need to increase food production while simultaneously minimizing environmental degradation that threatens agricultural sustainability. A new $20-million-dollar multi-institutional project funded by the National Science Foundation aims to contribute solutions to this challenge through cutting-edge microbiome research. Microbiomes comprise all of the genetic material within all of the microorganisms in a specific niche (e.g., soil, etc.). The project will use fundamental interdisciplinary research on Microbiomes of Aquatic habitats, Plants, and Soils (MAPS) to enhance ecosystem productivity, mitigate environmental degradation in agriculturally-dominated landscapes, and conserve native grasslands. Researchers at Kansas State University led by distinguished professors Walter Dodds (Biology) and Chuck Rice (Agronomy) will receive $2.65 million of the total award. 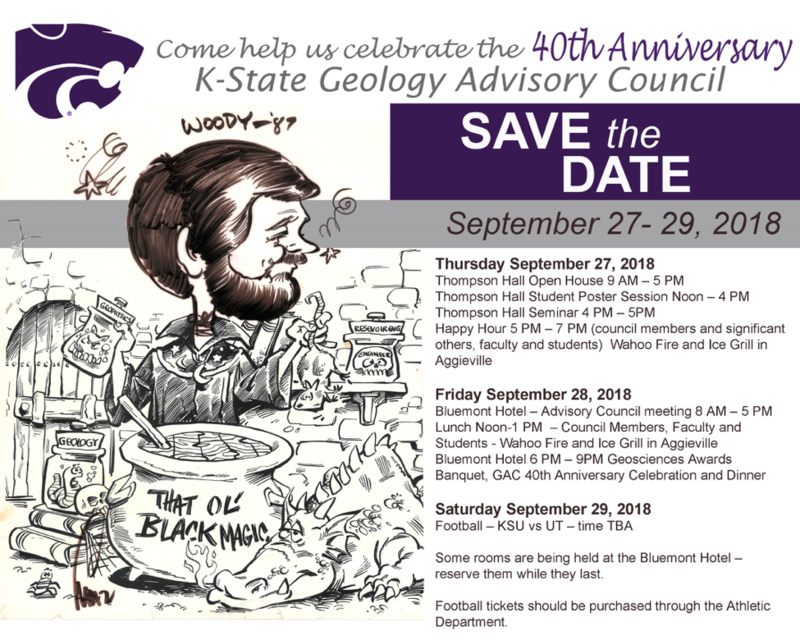 Within the project team, Dr. Matthew Kirk will represent the Department of Geology and serve as a group leader for team members who will examine soil microbiology and biogeochemistry. Field work for the project is starting this summer. Just after the semester, the soils team will collect soil cores from the main field sites. This summer they will also install soil monitoring arrays that will track hydrologic and geochemical parameters for years to come. This project is collecting a wide range of data and is expected to provide some exciting results so please stay tuned for updates!